The Tony Award winning production of "The Book of Mormon" is set to hit the stage Tuesday, Feb. 5 at The Saenger Theatre. And this satirical, quick-witted production is sure to give you a night full of laughs and new take on The Church of Jesus Christ of Latter-day Saints. The 2011 Best Musical winner follows a group of Mormon missionaries as they attempt to bring the Mormon religion to a remote Ugandan village. Written and created by Comedy Central's "South Park" writers Matt Stone and Trey Parker, "The Book of Mormon" uses satire and Comedy Central-related humor to poke fun at Mormonism and lightly point out the disease and devastation of certain areas of Africa. I chatted with actress Kayla Pecchioni, who is currently starring in "The Book of Mormon" as "Nabulungi," about the show, her experience and spending time in New Orleans. Kelly Massicot: What’s the best (quick!) way to describe THE BOOK OF MORMON (BOM) and what it’s all about? 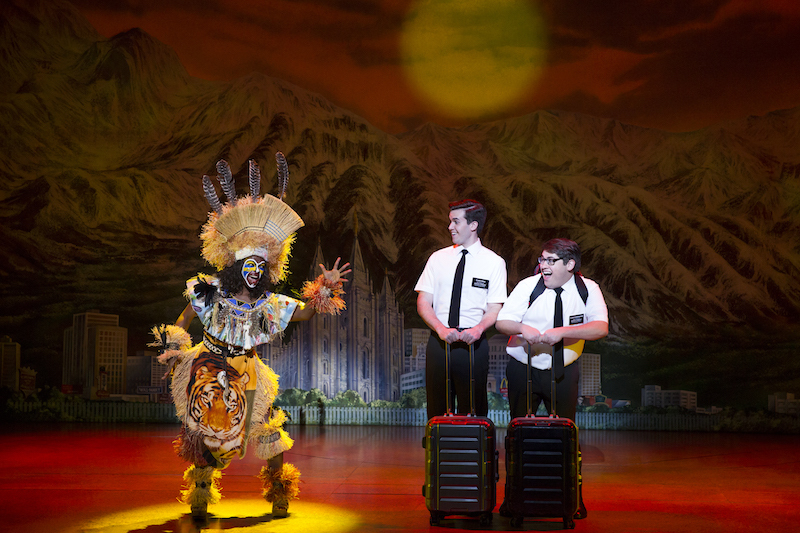 Kayla Pecchioni: The Book of Mormon is a musical comedy written by the writers of South Park. It’s about two young Mormon missionaries who are sent to Uganda, there they encounter an entirely different world from there own— so naturally, chaos and hilarity ensues! KM: What’s your favorite part about being in BOM? KP: My cast. The people I get to work with everyday are the reason why my job is more “fun” than “work”. We all work really hard and really well together on that stage and that’s what keeps the magic alive. KM: What’s your favorite part of the whole show? KP: Audience reactions. It’s no secret that our show is wildly inappropriate. And while the show is so popular (it won 9 Tony Awards and has been selling out shows since 2011), people always are shocked by just how far it’s willing to push the envelope. And that’s something we get to anticipate every night. KM: What can theatergoers expect to experience from the show? KP: You can definitely expect to laugh, but also I think you’ll be surprised. Not only from the more “shocking” material but also by just how beautifully the show wraps up. None of the jokes are done in poor taste and by the end it’s dripping in heart, so expect to take that ride with us. KM: Have you ever been to New Orleans? And what are you excited to experience in the city? KP: I stopped through New Orleans for a couple nights last year when we were traveling from one city to the next. At that time I did Bourbon Street, but this time around I have my eyes set finding the best beignet and maybe a haunted walking tour!